Raja Ampat Papua Most Popular and Best Places In Indonesia Raja Ampat is one of the archipelago pride of Indonesia located in the eastern part of Indonesia precisely in the area of West Papua. 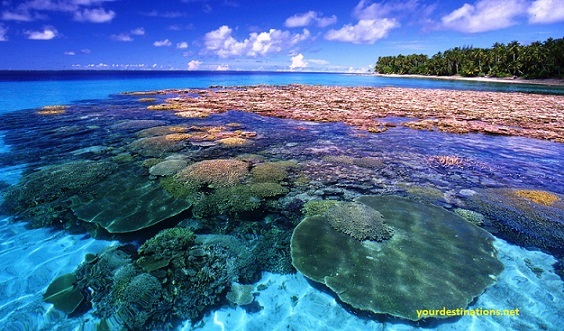 Raja Ampat has a beach is very famous and beautiful for its underwater beauty. Almost half of the world's fish species exist in the Raja Ampat sea. There are also many inns that offer the comfort and beauty of Raja Ampat natural scenery. Bali Island Most Popular and Best Places In Indonesia Bali is a popular tourist attraction in Indonesia. Everyone will know Indonesia from Bali. On the island of Bali, there are many tourist attractions that you can visit. There are beautiful Kuta beach tours to enjoy the sunset. There is Ubud that provides natural attractions with the rural atmosphere and there are also other tourist attractions that are not less beautiful like Bedugul, Tanah Lot and many more. Bunaken Sea Tour Most Popular and Best Places In Indonesia Indonesia is very famous for the beauty of underwater tourism one of them is the Bunaken marine park. Bunaken is located in North Sulawesi province. By doing snorkeling in the sea Bunaken, you will be pampered with the beauty of coral reefs and fish are very beautiful. Because of its underwater beauty, therefore Bunaken enter into the top 10 most popular tourist attractions in Indonesia. Prambanan Temple in Yogyakarta Most Popular and Best Places In Indonesia Yogyakarta is famous for its cultural tourism. The hospitality of its citizens, the safe atmosphere and the comfort of the city became the city's main attraction, commonly nicknamed by this student city. There are historical tours like Prambanan temple, Borobudur, Yogyakarta Palace and Taman Sari. For those of you who like to shop for clothes and a variety of souvenirs and even souvenirs with a very cheap price, you must visit the area of Malioboro. In addition to historical and cultural tours, in Yogyakarta, there also can enjoy the culinary tours of various types of food at very cheap prices. Senggigi Beach on Lombok Island The Most Popular and Best Places In Indonesia Lombok Island is located in the province of West Nusa Tenggara. Lombok Island is a collection of several small islands. Lombok Island tourism mostly is beach tourism. There is a beach Senggigi famous for its underwater beauty. There is a Gili island with several small islands such as Gili water, Gili Trawangan, and Gili Meno which has beautiful white sand that is very beautiful, with the beauty of it is not one of the islands of Lombok including 10 most popular and best attractions in Indonesia. Mount Bromo Most Popular and Best Places In Indonesia Never say already visited various tours in Indonesia if you have not visited Mount Bromo. Gunung Bromo is located in East Java precisely in Tengger Sumeru national park. You will be able to enjoy the charm of a very charming sunrise if you climb to the top of Mount Bromo. Komodo Island Most Popular and Best Places In Indonesia Komodo is an animal that entered one of the wonders of the world. Komodo only live on the island of Komodo. Komodo Island is located in the province of East Nusa Tenggara. In addition to enjoying this rarest animal life, you can also enjoy the beauty of nature that is not less amazing. Lake Toba Most Popular and Best Places In Indonesia One of the top 10 most popular tourist attractions in Indonesia is Lake Toba. The lake is located in the northern province of Sumatra. Lake Toba is a crater lake that contains a small island in the middle. Toba lake area is almost the same as the area of several districts, therefore Lake Toba is the largest lake in Southeast Asia. Toraja Most Popular and Best Places In Indonesia For those of you who like the cultural tour, you must visit the Land of Toraja which is included in the top 10 most popular tourist attractions in Indonesia. While visiting Toraja Land, come at the time of the death ceremony. Let you can seeing traditional ceremony Tanah Toraja people. All the top tourist attractions are mandatory always we are proud of, we guard and we preserve. 10 of the most popular and best tourist spots in Indonesia mentioned are State assets as well as the inheritance for our children and grandchildren. So we must guard it, lest all our wealth be taken by other countries because we neglected to keep it. The little information that can yourdestinations.net convey, may be useful.